A volcano is a geological landform usually generated by the eruption through a planet's surface of magma, molten rock welling up from the planet's interior. Other forms of volcano include ice volcanoes (particularly on some moons of Jupiter, Saturn and Neptune) and mud volcanoes. On Earth, volcanoes tend to occur near the boundaries of crustal plates. Important exceptions exist in hotspot volcanoes, which occur at locations far from plate boundaries; hotspot volcanoes are also found elsewhere in the solar system, especially on its rocky planets and moons. The name "volcano" is thought to derive from Vulcano, a volcanic island in the Aeolian Islands of Italy whose name in turn originates from Vulcan, the name of a god of fire in Roman mythology. The study of volcanoes is called volcanology (sometimes spelled vulcanology). Un volcán es una estructura geológica por la cual emerge magma (roca fundida) y gases del interior de un planeta. El ascenso ocurre generalmente en episodios de actividad violenta denominados erupciones. Erupción de un volcán Al acumularse el material arrastrado del interior se forma una estructura cónica en la superficie que puede alcanzar alturas de unas centenas de metros, hasta varios kilómetros. Al conducto que comunica el reservorio de magma o cámara magmática en profundidad con la superficie se le denomina chimenea. Esta termina en la cima del edificio volcánico, el cual esta rematado por una depresión o cráter. Concepción is one of the two volcanoes which make up the island of Ometepe, situated in Lake Nicaragua in Nicaragua, Central America. Concepción is an active volcano, having last erupted in 1998. 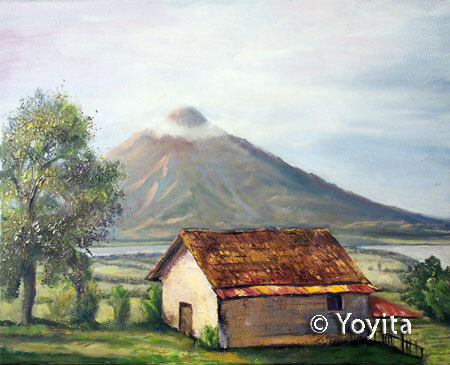 Concepción is a stratovolcano that forms the northwest part of the Isla de Ometepe. Since 1883 Concepción has erupted at least 24 times. 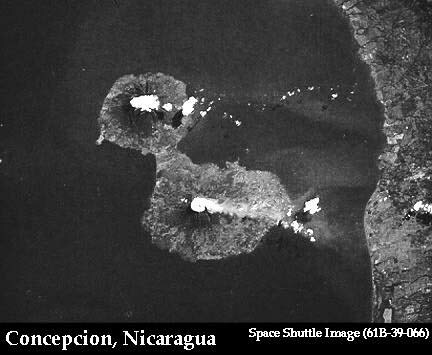 Eruptions are characterized by frequent moderate-sized explosions. Fumaroles are active just north of the summit crater at an elevation of 5,577 feet (1,700 m). Concepción - jeden z dwóch wulkanów, polozonych na wyspie Ometepe (drugi to Maderas), wyspie na Jeziorze Nikaragua. Ma on postac stratowulkanu, który wznosi sie na wysokosc ok. 1700 m n.p.m. Wspólrzedne geograficzne: 11°32'N 85°37'W. Concepción jest czynnym wulkanem. Od 1883 wulkan wybuchal przynajmniej 24 razy, a ostatnia erupcja miala miejsce w 2005 (wczesniej w 1998). Ze wzgledu na duza czestotliwosc erupcji, ich rozmiary sa raczeh niewielkie. Na pólnoc od krateru znajduje sie aktywne pole fumarol. Der Concepción ist ein Stratovulkan in Nicaragua. Zusammen mit dem Nachbarvulkan Madera bildet er die Insel Isla de Ometepe im Nicaraguasee. Der letzte Ausbruch datiert auf das Jahr 1999. Durch zahlreiche Ausbrüche in der letzten Hälfte des Jahrhunderts ist die Höhe deutlich über die in den meisten Aufzeichnungen angegebene angewachsen. Nejapa-Miraflores 360 1181 12.12° N 86.32° W Holocene Fissure vents located near the western margin of the Nicaraguan graben cuts through the western part of Nicaragua's capital city, Managua. Laguna Tiscapa crater is located several kilometers to the east near the central part of the city of Managua. De Concepción ontstond vroeg in het holoceen. Door voortdurende uitbarstingen bereikte de vulkaan haar huidige hoogte van 1610 meter. De vulkaan kende een zeer lange periode zonder erupties, maar op 8 december 1880 kwam het voor het eerst weer tot een uitbarsting. Deze uitbarsting was omvangrijk, en gedurende een jaar bleef de vulkaan actief. Andere uitbarstingen volgden in 1883, 1889, 1902, 1907, 1924. De meest recente uitbarsting vond plaats in 1957. Het natuurgeweld bij deze laatste uitbarsting was enorm, maar toch gaven maar weinig bewoners van het eiland gehoor aan de opdracht van de regering in Managua om het eiland te verlaten.